The Battle of Lewis's Farm (also known as Quaker Road, Military Road, or Gravelly Road) was fought on March 29, 1865, in Dinwiddie County, Virginia, during the American Civil War. It was the opening of the Appomattox Campaign, in which Confederate General Robert E. Lee's army was dislodged from their besieged lines around Petersburg, Virginia, and began a retreat that would lead them to surrender at Appomattox Court House. On March 29, 1865, in the opening moves of Lt. Gen. Ulysses S. Grant's spring offensive, Maj. Gen. Philip Sheridan marched with the army's cavalry followed by the V Corps toward Dinwiddie Court House to turn the right flank of Gen. Robert E. Lee's Petersburg defenses. The Union V Corps under Maj. Gen. Gouverneur K. Warren crossed Rowanty Creek, moved up the Quaker Road toward the Boydton Plank Road intersection, and encountered Maj. Gen. Bushrod Johnson's Confederate brigades. A sharp firefight forced the Confederates back to their entrenchments on the White Oak Road. The brigade of Brig. 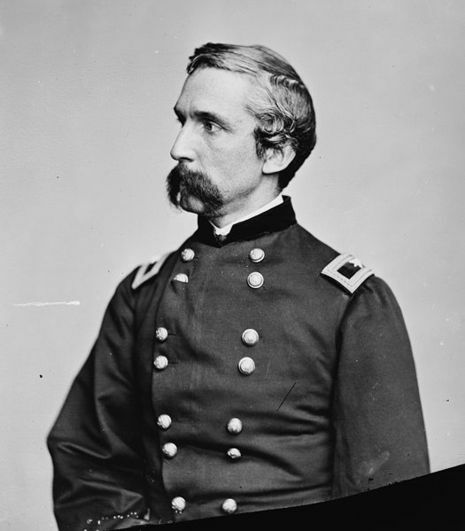 Gen. Joshua Chamberlain was conspicuous in the engagement, leading the main advance. 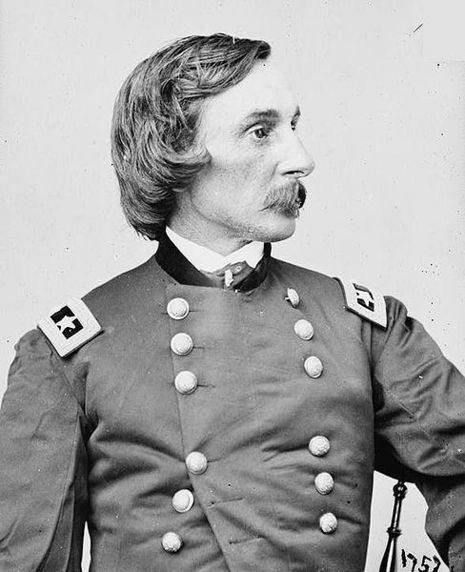 Lt. Gen. Richard H. Anderson ordered two brigades that had dug in to move forward to intercept Chamberlain, who, although wounded, rallied his troops with the help of a four-gun battery. Reinforced, Chamberlain counterattacked and captured the enemy's earthworks. Description: On March 29, in the opening moves of Grant’s spring offensive, Sheridan marched with the army’s cavalry followed by the V Corps toward Dinwiddie Court House to turn the right flank of Lee’s Petersburg defenses. 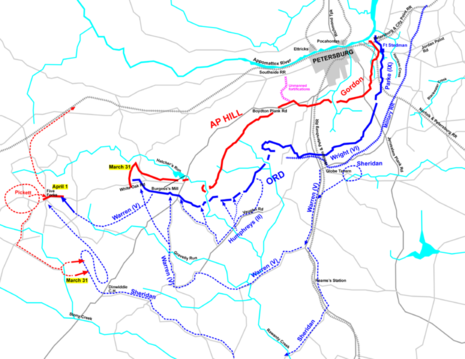 The Union V Corps under Maj. Gen. G.K. Warren crossed Rowanty Creek, moved up the Quaker Road toward the Boydton Plank Road intersection, and encountered Johnson's Confederate brigades. A sharp firefight forced the Confederates back to their entrenchments on the White Oak Road.